Contest rules blog. This blog houses rules to Sea-Doo digital contests. PARTICIPATION CONSTITUTES ENTRANT’S FULL AND UNCONDITIONAL AGREEMENT TO AND ACCEPTANCE OF THESE OFFICIAL RULES. The “Share Your #SeaDooLife” Contest (hereinafter referred to as the “Contest”) is for a limited time and begins on June 17, 2016 at 12:00 AM EST through July 17, 2016 11:59 PM EST. The Contest is sponsored by Bombardier Recreational Products Inc. (“BRP” or the “Sponsor”) 565, de la Montagne, Valcourt, Quebec, J0E 2L0. ELIGIBILITY: This Contest is open to legal residents of Canada and the United States (excluding Puerto Rico who have reached the age of majority in their states/provinces of residence as of the date the Contest begins. Employees of BRP, their subsidiaries, affiliates and advertising and promotional agencies of BRP and their immediate families (spouse, parents, children, siblings and their spouses) and individuals living in the same household as such employees are ineligible. This Contest is governed by the laws of Canada and subject to all applicable federal and provincial laws and regulations. VOID WHERE PROHIBITED OR RESTRICTED BY LAW. PRIZE: A total of one (1) winner will receive one (1) prize of one (1) voucher valued at $500 of Sea-Doo accessories, riding gear, and clothing. Before completing registration, the Entrant must accept and agree to the rules. An Entrant can register by completing all of the requested information, including valid e-mail address (“Address”), phone number and his/her first and complete last name (no initials). Once entrant provides the requested information, they will receive one (1) entry by submission by completing the entry form on the site or the mobile entry site. Entrant must upload a photo or video into the contest demonstrating their Sea-Doo experiences, adventures on the water and/or living the Sea-Doo life. Video or Photo submission: Entrant must post to the contest application, to receive one (1) entry. Entrants may submit unlimited entries using the same registration information. Each unique entry will count as one (1) unique submission. Entrant agrees that the Sponsor may capture the Entrant’s Instagram, Facebook or Twitter account information and complete registration. LOOK Marketing will monitor all entries. No cost related to Facebook subscription, see details at http://www.facebook.com. The Contest requires that an Entrant either already have or open an account on Facebook to participate. Photo(s) and video(s) entered into the contest become the property of Sponsor, but Sponsor is not responsible for the content that is posted by contest participants. On Tuesday July 19th 2016 the winning entry will be chosen by the BRP Sea-Doo team as best example of the entry request. Winner will be announced on Thursday 21 July 2016. Odds of winning depend on number of unique entries received. One (1) registration per individual. Unlimited unique entries per person. All other expenses not specifically listed in the description of the Prize, are the sole responsibility of the winners. The winner will be solely responsible for any applicable taxes and all other fees and expenses not specified herein associated with the receipt and use of this prize. The prize voucher will be sent to the winner. Decisions of the Sponsor in the selection and determination of winner and all matters relating to this Contest are final and binding. The Sponsor will attempt to contact potential winners between 9:00 AM EST and 5:00 PM EST, Monday to Friday, for a period of five (5) business days following the date of the prize draw. If the Sponsor is not able to make contact and speak directly with a potential winner within the allotted time, using the email address and/or telephone number the potential winner will have provided, then at the sole and absolute discretion of the Sponsor, that Entrant may be disqualified, and his/her entitlement to receive the prize may be forfeited, and the Sponsor reserves the right to randomly select another potential winner, whom the Sponsor will attempt to contact, and who will be subject to disqualification, in the same manner. These rules are published on https://blog.sea-doo.com/TBD. At the end of the contest, the winner’s name will be published on https://blog.sea-doo.com/2016/06/15/share-your-seadoolife-contest-june-2016/ and on https://Facebook.com/SeaDoo. Once the official winner has been identified, he/she will be sent the following week an affidavit of eligibility and liability/publicity release and a W-9 form (for US resident winners only). All relevant documents must be signed and returned to Sponsor within five (5) days of the date of the liability/publicity release to become the official winner, or the prize will be forfeited and an alternate winner will be selected. All prize claims are subject to verification. Should the possible winner be a Canadian resident, he/she will have to answer a skill question (2 X 10 ÷ 4 + 30 – 2) before being declared the Grand Prize winner and being awarded the prize. By accepting the prize, Entrant consents to the use of his/her name, photograph, image, voice, and statements related to the Contest, for advertising purposes, without further compensation. There are no transfers, substitution and prize is non-refundable. No cash alternatives for any prize, except at the option of the Sponsor, who may substitute a prize of equal or greater value if advertised prize becomes unavailable. Voucher expires on December 31, 2016. Contest materials are automatically void if they are reproduced, mutilated, forged, altered or tampered with in any way, if they are obtained through unauthorized, illegitimate channels, or if they contain printing, production, typographical, mechanical or other errors. Liability for game pieces containing printing or other errors is limited to replacement with another game piece while supplies last. Only the number of prizes stated in the Official Rules will be awarded. This Contest is subject to all applicable federal, state, provincial and municipal laws and regulations and is void where prohibited by law. This Contest is in no way sponsored, endorsed or administered by, or associated with, Facebook. Entrants are providing their information to Sponsor and not to Facebook. The information provided will only be used as stated in the Contest Rules. Facebook is completely released of all liability by each Entrant (and, if the entrant is at least 18 but under the age of majority in his/her province/state/territory of residence, his/her parent or legal guardian) for this Contest. Any questions, comments or complaints regarding the Contest must be directed to the Sponsor. Sponsor is not responsible for lost, late, damaged, misdirected, defaced, mutilated, illegible, incomplete, postage-due, or altered mail or prize claims or other entries or matters pertinent to this Contest. Winners are randomly selected. The Sponsor is not responsible for printing, distribution or production errors or errors by mechanical readers or for lost, late, misdirected or postage-due mail or entries. In the event that production, seeding, printing or other errors cause more than the stated number of prizes of any category to be claimed, Sponsor reserves the right to suspend delivery of prizes, without prior notice. By entering this Contest, winner acknowledges and agrees that Bombardier Recreational Products Inc., BRP US Inc., their affiliates and their respective officers, directors, employees, dealers, agents and insurers (collectively, “the Released Parties”) (i) shall have no liability of any kind whatsoever with respect to this Contest and/or the awarding or use of the Prizes, (ii) make no warranty, guaranty or representation of any kind concerning the Prizes, (iii) disclaim any implied warranty of merchantability or fitness for any purpose, and (iv) are not liable for injury, accident, loss or damage of any kind resulting from the acceptance, conveyance or use of the Prizes or from participating in this Contest. The Release Parties are not responsible for typographical errors or any other errors in the offer or administration of this Contest, including but not limited to errors in the advertising, the Official Rules, the selection and announcement of winners, or the distribution of the Prizes. Share video of your exhilarating, fun-filled Sea-Doo Life with us for a chance to win Sea-Doo Accessories, Riding Gear, and Clothing valued up to $750 AUD. FIRST PRIZE: One (1) voucher valued at $750 (AUD) of Sea-Doo accessories, riding gear, and clothing. SECOND PRIZE: One (1) voucher valued at $500 (AUD) of Sea-Doo accessories, riding gear, and clothing. THIRD PRIZE: One (1) voucher valued at $250 (AUD) of Sea-Doo accessories, riding gear, and clothing. 1) PARTICIPATION CONSTITUTES ENTRANT’S FULL AND UNCONDITIONAL AGREEMENT TO AND ACCEPTANCE OF THESE OFFICIAL RULES. The “Show Off Your Sea-Doo Life” Contest (hereinafter referred to as the “Contest”) is for a limited time and begins on January 26, 2016 at 6:00 AM AEDT through February 29, 2016 11:59 PM AEDT. The Contest is sponsored by Bombardier Recreational Products Inc. (“BRP” or the “Sponsor”), 6 Lord Street, Botany. NSW 2019. 4) ELIGIBILITY: This Contest is open to legal residents of Australia or New Zealand who have reached the age of majority in their states/provinces of residence as of the date the Contest begins and have a valid email address. Employees of BRP, their subsidiaries, affiliates and advertising and promotional agencies of BRP, and their immediate families (spouse, parents, children, siblings and their spouses) and individuals living in the same household as such employees are ineligible. This Contest is governed by the laws of Australia and subject to all applicable federal and provincial laws and regulations. VOID WHERE PROHIBITED BY LAW. • FIRST PRIZE: One (1) voucher valued at $750 (AUD) of Sea-Doo accessories, riding gear, and Clothing. • SECOND PRIZE: One (1) voucher valued at $500 (AUD) of Sea-Doo accessories, riding gear, and clothing. • THIRD PRIZE: One (1) voucher valued at $250 (AUD) of Sea-Doo accessories, riding gear and clothing. a. Before completing registration, the Entrant must accept and agree to the rules. b. An Entrant can register by completing all of the requested information, including valid e-mail address (“Address”), phone number and his/her first and complete last name (no initials). c. Once entrant provides the requested information, they will receive one (1) entry by submission by completing the entry form on the site or the mobile entry site. d. Entrant must upload a video into the contest demonstrating their Sea-Doo experiences, adventures on the water and/or living the Sea-Doo life. Video submission: Entrant must post to the contest application, to receive one (1) entry. 7) Entrants may submit unlimited entries using the same registration information. Each unique entry will count as one (1) unique submission. 8) Entrant agrees that the Sponsor may capture the Entrant’s Instagram, Facebook or Twitter account information and complete registration. 9) LOOK Marketing will monitor all entries. 10) No cost related to Facebook.com/SeaDooAust subscription, see details at http://www.facebook.com. 11) The Contest requires that an Entrant either already have or open an account on Facebook to participate. 12) Video(s) entered into the contest become the property of Sponsor, but Sponsor is not responsible for the content that is posted by contest participants.  Contain any images or words that are obscene or offensive, endorse any form of hate or hate group. i. On March 3, 2016 three entries chosen by the BRP Sea-Doo team as best examples of the entry request will be selected at office located at Bombardier Recreational Products Inc., 6 Lord Street, Botany. NSW 2019.
ii. Winner(s) will be selected based on creativity and originality of submitted videos. iii. Odds of winning depend on number of unique entries received. iv. One (1) registration per individual. Unlimited unique entries per person. 15) All other expenses not specifically listed in the description of the Prize, are the sole responsibility of the winners. 16) The winner will be solely responsible for any applicable taxes and all other fees and expenses not specified herein associated with the receipt and use of this prize. The prize voucher will be sent to the winner. 17) Promotion Entities shall not be held responsible for any delays in awarding prizes for any reason outside of their control. Prizes will only be delivered to verified Winners. 18) Decisions of the Sponsor in the selection and determination of winner and all matters relating to this Contest are final and binding. The Sponsor will attempt to contact potential winners between 9:00 AM AEDT and 5:00 PM AEDT, Monday to Friday, for a period of five (5) business days following the date of the prize draw. If the Sponsor is not able to make contact and speak directly with a potential winner within the allotted time, using the email address and/or telephone number the potential winner will have provided, then at the sole and absolute discretion of the Sponsor, that Entrant may be disqualified, and his/her entitlement to receive the prize may be forfeited, and the Sponsor reserves the right to randomly select another potential winner, whom the Sponsor will attempt to contact, and who will be subject to disqualification, in the same manner. 19) To become an official winner, all relevant documents must be signed and returned to Sponsor within five (5) business days from the time the affidavit of eligibility and liability/publicity release, as applicable, have been sent by Sponsor, or the prize will be forfeited and another potential winner will be drawn. All prize claims are subject to verification. 20) These rules are published on https://blog.sea-doo.com/show-off-your-sea-doo-life.html. At the end of the contest, the winner’s name will be published on https://blog.sea-doo.com/show-off-your-sea-doo-life.html and on https://Facebook.com/SeaDooAust. 21) By accepting the prize, Entrant consents to the use of his/her name, photograph, image, voice, and statements related to the Contest, for advertising purposes, without further compensation. There are no transfers, substitution and prize is non-refundable. No cash alternatives for any prize, except at the option of the Sponsor, who may substitute a prize of equal or greater value if advertised prize becomes unavailable. 22) Vouchers expire on December 31, 2016. 23) Sponsor reserves the right to terminate this Contest in whole or in part at any time without liability. Sponsor is not responsible if, for any reason, the game is not capable of running as planned, or for any infection by computer virus, bugs, tampering, unauthorized intervention, fraud, technical failures, or any other causes beyond the control of Sponsor which corrupt or affect the administration, security fairness, integrity or proper conduct of this promotion or of any person’s computer hardware or software. Should the game be terminated prior to the stated expiration date, notice will be posted on https://blog.sea-doo.com/show-off-your-sea-doo-life.html. 24) Contest materials are automatically void if they are reproduced, mutilated, forged, altered or tampered with in any way, if they are obtained through unauthorized, illegitimate channels, or if they contain printing, production, typographical, mechanical or other errors. Liability for game pieces containing printing or other errors is limited to replacement with another game piece while supplies last. Only the number of prizes stated in the Official Rules will be awarded. This Contest is subject to all applicable federal, state, provincial and municipal laws and regulations and is void where prohibited by law. 25) This Contest is in no way sponsored, endorsed or administered by, or associated with, Facebook. Entrants are providing their information to Sponsor and not to Facebook. The information provided will only be used as stated in the Contest Rules. Facebook is completely released of all liability by each Entrant (and, if the entrant is at least 18 but under the age of majority in his/her province/state/territory of residence, his/her parent or legal guardian) for this Contest. Any questions, comments or complaints regarding the Contest must be directed to the Sponsor. 26) Sponsor is not responsible for lost, late, damaged, misdirected, defaced, mutilated, illegible, incomplete, postage-due, or altered mail or prize claims or other entries or matters pertinent to this Contest. Winners are randomly selected. The Sponsor is not responsible for printing, distribution or production errors or errors by mechanical readers or for lost, late, misdirected or postage-due mail or entries. In the event that production, seeding, printing or other errors cause more than the stated number of prizes of any category to be claimed, Sponsor reserves the right to suspend delivery of prizes, without prior notice. 27) By entering this Contest, winner acknowledges and agrees that Bombardier Recreational Products Inc., BRP US Inc., their affiliates and their respective officers, directors, employees, dealers, agents and insurers (collectively, “the Released Parties”) (i) shall have no liability of any kind whatsoever with respect to this Contest and/or the awarding or use of the Prizes, (ii) make no warranty, guaranty or representation of any kind concerning the Prizes, (iii) disclaim any implied warranty of merchantability or fitness for any purpose, and (iv) are not liable for injury, accident, loss or damage of any kind resulting from the acceptance, conveyance or use of the Prizes or from participating in this Contest. The Release Parties are not responsible for typographical errors or any other errors in the offer or administration of this Contest, including but not limited to errors in the advertising, the Official Rules, the selection and announcement of winners, or the distribution of the Prizes. ©2015 Bombardier Recreational Products Inc. (BRP). All rights reserved.™, ® and the BRP logo are trademarks of BRP or its affiliates. PARTICIPATION CONSTITUTES ENTRANT’S FULL AND UNCONDITIONAL AGREEMENT TO AND ACCEPTANCE OF THESE OFFICIAL RULES. The “#SEADOONEXTLEVEL Contest (hereinafter referred to as the “Contest”) is for a limited time and begins on October 7, 2015 at 09:00 am ET through October 12, 2015, 11:59 pm ET. The Contest is sponsored by Bombardier Recreational Products Inc. (“BRP” or the “Sponsor”), 565, de la Montagne, Valcourt, Quebec, J0E 2L0. ELIGIBILITY: This Contest is open to legal residents of Canada and the United States (excluding Quebec and Puerto Rico) who have reached the age of majority in their states/provinces of residence as of the date the Contest begins. Employees of BRP, their subsidiaries, affiliates and advertising and promotional agencies of BRP, and their immediate families (spouse, parents, children, siblings and their spouses) and individuals living in the same household as such employees are ineligible. This Contest is governed by the laws of Canada and subject to all applicable federal and provincial laws and regulations. VOID WHERE PROHIBITED BY LAW. A trip CGX2™ Camera by Cyclops Gear° (value of $299.99 USD). The CGX2 Camera will be available starting December 2015 exclusively in BRP dealerships and at BRP online stores. Winner will be notified when the Camera will be available and we will ship the camera to the winner’s closest BRP/Sea-Doo dealer for winner pick-up. Entrant must upload a photo or 15 second video into the contest including a 2016 Sea-Doo RXP-X 300, RXT-X 300 and/or GTX Limited 300 model. For example: If a contestant posts their photo submission on Instagram and tags it with the hashtag #SEADOONEXTLEVEL, the photo will be pulled into the contest. Entrants may submit unlimited entries using the same process. Each unique entry will count as one (1) unique submission. Entrant agrees that the Sponsor may capture the Entrant’s Instagram, Facebook or Twitter account information. BRP Social Media management staff will monitor all entries and will tally all applicable entries. The Contest requires that an Entrant either already have or open an account on Facebook, Twitter or Instagram to participate. Photos entered into the contest become the property of Sponsor, but Sponsor is not responsible for the content that is posted by contest participants. The pick will be made on October 13, 2015 at Sponsor office located at Bombardier Recreational Products Inc., 565, de la Montagne, Valcourt, Quebec, J0E 2L0. Winner will be selected by photo that best captures the essence of the new 300-hp Sea-Doo watercraft as chosen by Sea-Doo brand marketing representatives. Unlimited unique entries per person. Sponsor BRP will accommodate the official winner prize. Based on that, the prize will be shipped to the winner’s closest BRP/Sea-Doo dealer in the best time possible considering availabilities, after verification, which will allow Sponsor to verify winner’s compliance with these Official Rules. Official winner must agree to accept Prize in entirety. The winner will be solely responsible for any applicable taxes, memory cards, and expenses not specified herein associated with the receipt and use of this prize. The prize will be mailed to the closest BRP/Sea-Doo dealer and winner will be responsible for picking the prize up from that dealer. Decisions of the Sponsor in the selection and determination of winner and all matters relating to this Contest are final and binding. The Sponsor will attempt to contact potential winners between 9:00 AM ET and 5:00 PM ET, Monday to Friday, for a period of five (5) business days following the date of the prize draw. If the Sponsor is not able to make contact and speak directly with a potential winner within the allotted time, using the email address and/or telephone number the potential winner will have provided, then at the sole and absolute discretion of the Sponsor, that Entrant may be disqualified, and his/her entitlement to receive the prize may be forfeited, and the Sponsor reserves the right to randomly select another potential winner, whom the Sponsor will attempt to contact, and who will be subject to disqualification, in the same manner. To become an official winner, all relevant documents must be signed and returned to Sponsor within five (5) business days from the time the affidavit of eligibility, as applicable, have been sent by Sponsor, or the prize will be forfeited and another potential winner will be drawn. All prize claims are subject to verification. The CGX2 Camera will be available starting December, 2015 exclusively in authorized BRP dealers and at BRP online stores. No cash substitutions for prize will be permitted and prize is nonrefundable. Odds of winning depend upon the number of participation. Sponsored by BRP. #FINDYOURSPARK and you could WIN ONE! Looking for a chance to win an all new 2014 Sea-Doo Spark watercraft? How? Visit your local boat, motorcycle or automobile show and #FINDYOURSPARK at the Sea-Doo exhibit. 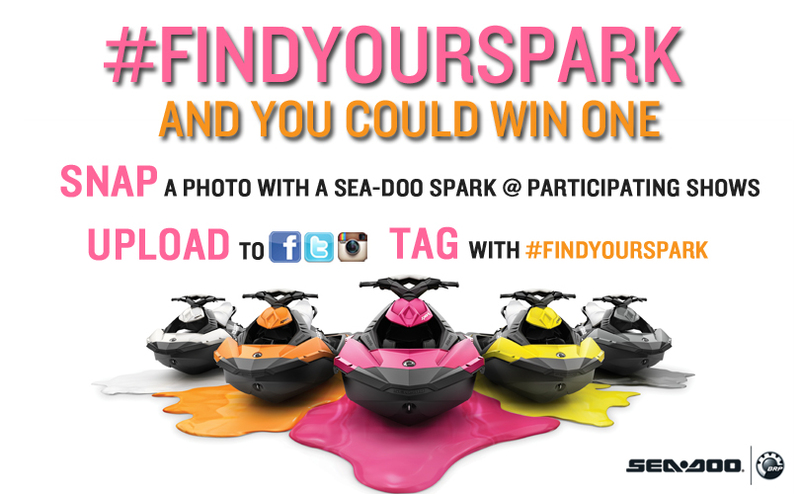 Snap an image of yourself with a Sea-Doo Spark, tag the photo with #FINDYOURSPARK and uploading it to our contest. 1. Visit a Boat Show, Motorcycle Show or Automobile show and #FINDYOURSPARK at a dealer or corporate booth. Click here to find a participating boat, auto or motorcycle show in your area. 2. SNAP a photo of yourself with a Sea-Doo Spark watercraft and the #FINDYOURSPARK sign. 3. Upload this photo on our Facebook photo page to enter to win. OR enter the contest by submitting this photo on Instagram or Twitter and hashtagging your photo with #FINDYOURSPARK. Once submitted you will receive an auto reply (within 24 hours) with instructions to claim your photo and enter the sweepstakes. You will need to claim your entry to finalize your contest entry. The sweepstakes starts December 6, 2013 and ends February 28, 2014. We will draw a winner, randomly, on March 7, and it could be YOU! DRAW Date: March 10, 2014) PARTICIPATION CONSTITUTES ENTRANT’S FULL AND UNCONDITIONAL AGREEMENT TO AND ACCEPTANCE OF THESE OFFICIAL RULES. The #SPARKSOMEFUN with Sea-Doo & deadmau5 Sweepstakes (hereinafter referred to as the “Sweepstakes”) is for a limited time and begins on February 14, 2014 at 9:00 am ET through March 9, 2014, 11:59:59 pm ET. (the “Sweepstakes Period”). The Sweepstakes is sponsored by Bombardier Recreational Products Inc. (“BRP” or the “Sponsor”), 565, de la Montagne, Valcourt, Quebec, J0E 2L0. 4) ELIGIBILITY: This Sweepstakes is open to legal residents of Canada and the United States (excluding Puerto Rico and Québec) who have reached the age of majority in their states/provinces of residence as of the date the Sweepstakes begins, and have a valid Facebook account and a valid email address. Employees of BRP, their subsidiaries, affiliates and advertising/promotional agencies, their immediate families (spouse, parents, children, siblings and their spouses) and individuals living in the same household as such employees are ineligible. This Sweepstakes is governed by the laws of Canada and subject to all applicable federal and provincial laws and regulations. VOID WHERE PROHIBITED BY LAW. Each draw includes: Accommodation in a double-occupancy for two (2) nights at the Fontainebleau Hotel, March. 22-24, 2014, Miami, Florida, two (2) round-trip economy airfare from anywhere in United States or Canada, ground transportation included, two (2) tickets to the private deadmau5 concert, March 23, 2014, Fontainebleau Hotel, Miami Beach, Fla. In order to enter the Sweepstakes, participants need to have a valid email address and Facebook account. During the Sweepstakes Period, an eligible individual (“Entrant”) may enter the Sweepstakes by logging on to Facebook and visiting http://www.facebook.com/seadoo (the “Page”). If the Entrant does not already “Like” the Sweepstakes Page, the Entrant must “Like” the Page before registering. An Entrant must register by completing all of the requested information, including valid e-mail address (“Address”), his/her first and complete last name (no initials), Zip Code/Postal Code and phone number. i. Upon completing registration, the Entrant will receive one (1) entry into the Sweepstakes Pool. ii. After completing the registration, the Entrant will receive a contest link generated by the application that can be shared via Facebook, Twitter or email, and will be prompted to share the Sweepstakes with up to ten (10) friends to receive additional entries. When a friend completes the registration form to enter the Sweepstakes, the original Entrant will receive an additional entry into the Sweepstakes. There is a maximum of 10 additional entries into the Sweepstakes. iii. Participants may visit the tab in the application to verify the status of their friend’s sign up(s). iv. The third party application provider, Offerpop, will monitor all entries and will tally all applicable entries. v. Only one Entry per person/Facebook Account (regardless of whether one person has more than one Facebook Account or more than one person uses the same Facebook Account). It is solely the Entrant’s responsibility to notify Sponsor in writing if his/her Facebook Account changes. 7) SELECTION OF WINNER AND PRIZE CLAIM: Draw will be held on March 10, 2014 at Sponsor office located at Bombardier Recreational Products Inc., 565, de la Montagne, Valcourt, Quebec, J0E 2L0. Winners are randomly selected. Odds of winning depend on number of entries received. 8) Decisions of the Sponsor in the selection and determination of winners and all matters relating to this Sweepstakes are final and binding. Before being declared a winner and in order to be eligible to win a prize, potential winner must first correctly answer, without mechanical aid or assistance, a mathematical skill-testing question (for Canadian resident winners only) and complete an affidavit of eligibility and a liability/publicity release and a W-9 form (for US resident winners only). The Sponsor will attempt to contact potential winners between 9:00 AM ET and 5:00 PM ET, Monday to Friday, for a period of three (3) business days following the date of the prize draw. If the Sponsor is not able to make contact and speak directly with a potential winner within the allotted time, using the email address and/or telephone number the potential winner will have provided, then at the sole and absolute discretion of the Sponsor, that Entrant may be disqualified, and his/her entitlement to receive the prize may be forfeited, and the Sponsor reserves the right to randomly select another potential winner, whom the Sponsor will attempt to contact, and who will be subject to disqualification, in the same manner. 9) Once the official winners have been identified, they will be sent an affidavit of eligibility and liability/publicity release and a W-9 form (for US resident winners only). To become an official winner, all relevant documents must be signed and returned to Sponsor within three (3) business days from the time the affidavit and liability/publicity release is postmarked as having been sent by Sponsor, or the prize will be forfeited and another potential winner will be drawn. All prize claims are subject to verification. Should a potential winner be a Canadian resident, he/she must first correctly answer, without assistance of any kind, a time-based mathematical skill-testing question (i.e. : 2 X 10 ÷ 4 + 30 – 2) before being declared a winner and being awarded the prize. 10) All other expenses not specifically listed in the description of the Prize, are the sole responsibility of the winners and their guests including but not limited to: travel to and from the international airport nearest the participant’s home in United States or Canada, all ground transfers (except transportation between the airport and hotel, airport fees, personal charges at lodging, gratuities, meals, taxes, medical, accident, luggage, insurance and any items of a personal nature. Each winner and his/her traveling companion (“Guest”) must travel at the same time and from the same city. A winner’s Guest must remain the same for the duration of the trip. A winner’s Guest, or their parent/legal guardian if under the age of majority, will be required to complete a full Liability and Publicity Release prior to travel. Winners and Guests are responsible for obtaining all necessary travel documentation. Depending on place of residence, winners and guests may need a valid passport to be able to claim the prize because of cross-border travel related requirements. If a winner is not admissible to travel outside his/her country of residency, then an alternate winner will be chosen. 11) The winners must be available to travel from March 22 to March 24, 2014. The trip must be scheduled before March 21, 2014. A representative will contact the winners to make travel arrangements. 12) The winners will be solely responsible for any applicable taxes, vehicle title, license and registration fees, freight, delivery, emissions, inspection, additional equipment, insurance, gasoline, vehicle maintenance, all other fees and expenses not specified herein associated with the receipt and use of this prize vehicle. The vehicle won must be warranty registered in the name of the winner. The winners must take delivery of the prize at a participating authorized BRP dealer confirmed by Sponsor no later than July 31, 2014, or prize will be forfeited. 13) These rules are published on the Sea-Doo Offerpop Facebook application. At the end of the contest, the winner’s name will be published on http://www.facebook.com/seadoo website. 14) By accepting the prize, participant consents to the use of his/her name, photograph, image, voice, and statements related to the Sweepstakes, for advertising purposes, without further compensation. There are no transfers, substitution and prize is non-refundable. No cash alternatives for any prize, except at the option of the Sponsor, who may substitute a prize of equal or greater value if advertised prize becomes unavailable. 15) Sponsor reserves the right to terminate this Sweepstakes in whole or in part at any time without liability. Sponsor is not responsible if, for any reason, the game is not capable of running as planned, or for any infection by computer virus, bugs, tampering, unauthorized intervention, fraud, technical failures, or any other causes beyond the control of Sponsor which corrupt or affect the administration, security fairness, integrity or proper conduct of this promotion or of any person’s computer hardware or software. Should the game be terminated prior to the stated expiration date, notice will be posted on http://www.facebook.com/seadoo. 16) Sweepstakes materials are automatically void if they are reproduced, mutilated, forged, altered or tampered with in any way, if they are obtained through unauthorized, illegitimate channels, or if they contain printing, production, typographical, mechanical or other errors. Liability for game pieces containing printing or other errors is limited to replacement with another game piece while supplies last. Only the number of prizes stated in the Official Rules will be awarded. This Sweepstakes is subject to all applicable federal, state, provincial and municipal laws and regulations and is void where prohibited by law. 17) Entries generated by script, macro or other automated [or mechanical] means or means which subvert the entry process will be void. All entries become the property of Sponsor and will not be acknowledged or returned. 19) Sponsor is not responsible for lost, late, damaged, misdirected, defaced, mutilated, illegible, incomplete, postage-due, or altered mail or prize claims or other entries or matters pertinent to this Sweepstakes. Winners are randomly selected. The Sponsor is not responsible for printing, distribution or production errors or errors by mechanical readers or for lost, late, misdirected or postage-due mail or entries. In the event that production, seeding, printing or other errors cause more than the stated number of prizes of any category to be claimed, Sponsor reserves the right to suspend delivery of prizes, without prior notice. 20) By entering this Sweepstakes, each winner acknowledges and agrees that Bombardier Recreational Products Inc., BRP US Inc., their affiliates and their respective officers, directors, employees, dealers, agents and insurers (collectively, “the Released Parties”) (i) shall have no liability of any kind whatsoever with respect to this Sweepstakes and/or the awarding or use of the Prizes, (ii) make no warranty, guaranty or representation of any kind concerning the Prizes, (iii) disclaim any implied warranty of merchantability or fitness for any purpose, and (iv) are not liable for injury, accident, loss or damage of any kind resulting from the acceptance, conveyance or use of the Prizes or from participating in this Sweepstakes. The Release Parties are not responsible for typographical errors or any other errors in the offer or administration of this Sweepstakes, including but not limited to errors in the advertising, the Official Rules, the selection and announcement of winners, or the distribution of the Prizes.